Yet again the Wood Plank background has had an inking and I dry embossed the panels with a woodgrain embossing folder. 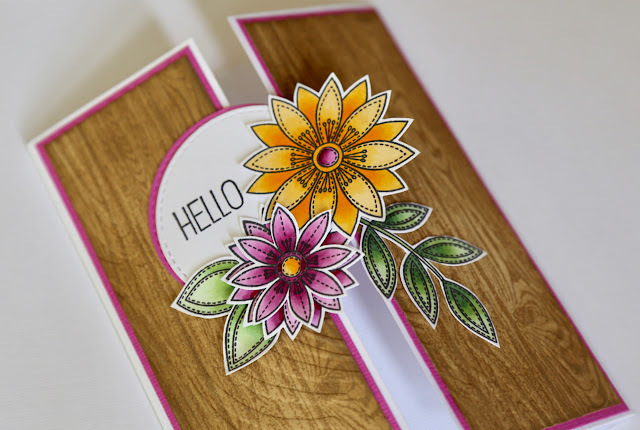 The cluster of blooms are from Funky Flowers and I've used part of a sentiment from Polynesian Paradise. Happy with how it's turned out but it was almost impossible to photograph. Chuffed to bits to finish all four challenges - it might have something to do with the fact that both kids have been sick all weekend and I've not been able to go out!